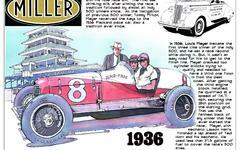 I just got the green light from Linda Jones, President of Gilbert Art, to post images of original work from acclaimed artist WK Gilbert, who has been selected to create art for the upcoming movie about the first Indianapolis 500. They are great people and Gilbert's art captures the glory that was that landmark sporting event. There will never be anything like it again.